Life is a beach when you’re in an Italian state of mind. Our next pop up hits this message home, as we welcome Chicago back into the Harry’s house in August. Tickets are now live for Spiaggia Pizzeria with chef Tony Mantuano! You may remember him from season two of Bravo’s “Top Chef Masters,” but Tony is so much more than a chef who has appeared on the small screen. In 2005, he was recognized as the James Beard Foundation’s Best Chef Midwest, for one. The chef/partner of Spiaggia (Chicago,) Lorenzo (South Beach,) Bar Toma (Chicago,) Terzo Piano (Art Institute of Chicago,) and Mangia Trattoria (Wisconsin) also has a huge soft spot for a cause that we care about — Alex’s Lemonade Stand Foundation. In fact, Michael and Roel will fly out to The Windy City one week after Spiaggia Pizzeria to join Tony and pop alumnus Paul Kahan as they host the first Lemon Chicago event. To say Tony’s been busy doesn’t quite capture it. He’s opening a contemporary American tavern called River Roast in Chicago’s River North neighborhood this month, and this year marks Spiaggia’s 30th (!!!) anniversary. Amazing! After esteemed visiting guests Gabrielle Hamilton, Jonathan Waxman, Marc Vetri, Jonathon Sawyer, Kevin Sbraga, Jon Shook and Vinny Dotolo, Paul Grieco, Chris Hastings, Hugh Acheson, Andrew Carmellini, Mindy Segal, Paul Kahan, April Bloomfield, Bill Telepan, Joey Campanaro, Jeff Michaud, Matthew Accarrino, Michael Solomonov, Ben Ford, and John Currence, Ken Oringer and Jamie Bissonnette, Jenn Louis, Mike Lata, and Matt McCallister, Michael is thrilled to welcome Tony to take over Harry’s Pizzeria on Tuesday, August 5 at 7PM! You know the drill. Seating is first come, first served for this family-style meal at our casual neighborhood joint. Making new friends is encouraged and easy when you’ve got a welcome cocktail in hand with hors d’oeuvres, four courses, free-flowing wines by The Genuine Hospitality Group sommelier and wine director Eric Larkee and our tap beers at your disposal. Take home something special, too. All that and tax and gratuity are included in the ticket price of $150. We’ll release the menu in a couple of weeks and hope to see you on August 5. 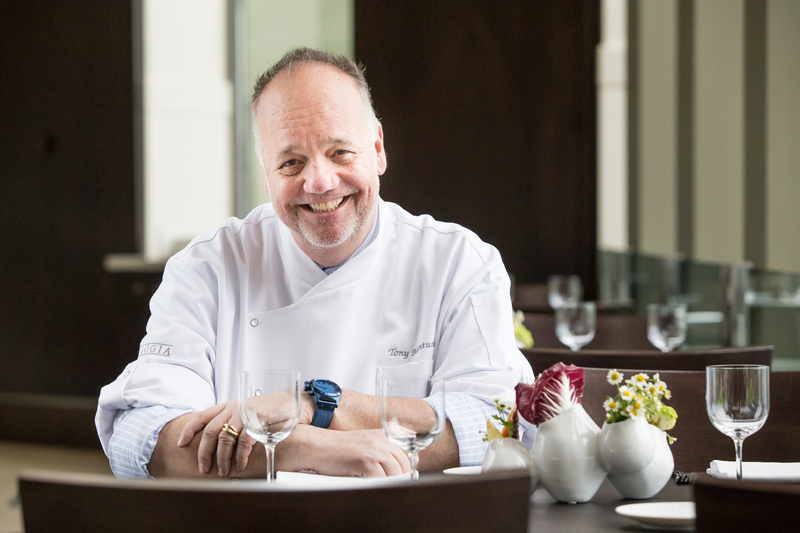 In the meantime, you can get a taste of what’s to come by following @TonyMantuano and @SpiaggiaChicago on Twitter and Instagram. We are! How are tickets purchased. I did not see such a link. Apologies for the delay in replying. You can find tickets at the “SPIAGGIA PIZZERIA” link at the top of harryspizzeria.com! Or visit harryspizzeria.com/FUN and it’s there too!